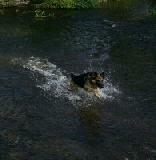 Maximus loves the water, as you can see in the picture and his long walks in the Countryside. Bless your heart for rescuing this fine young man! What a fine young German Shepherd he is - and I love the name - Maximus Prime (your family must be big Transformer's fans). It is so sweet to hear how good he gets along with your other pets - even the bunnies. That is definitely testament to a great temperament. The picture you've sent in is great too. I absolutely love that he is a swimmer. Almost all my German Shepherds have been water lovers. Needless to say, my yards are covered in more that one pool during the summer months! In fact, one of my girls loved water and swimming so much that I could have sworn she was part Newfie or Lab - LOL! It is such great exercise too! So congratulations on the rescue of Maximus Prime. He is definitely a positive case study in German Shepherd rescue. I wish you continued success with him and nothing but the best. Thanks for taking the time and sharing him with us!